Please be aware that all prices on this website are in EURO and include 20% VAT. FLK Light Sensor Technology. Unchanged MK22 features, well known exclusice play feel. 2 Stereo Pedal + 2 Expression inputs, TRS RTS compatible, calibration possible. 3290.- Showroom model. Slight traces of usage. USB Firmware Loader for PC and Mac. 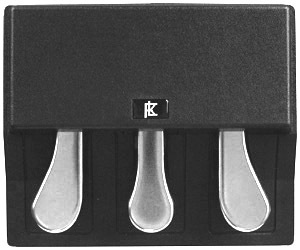 Based on the MK22 Studio FLK produces the first Controller Keyboard with 97 keys worldwide with the patented FLK light sensors. Integrated USB Firmware Loader for PC and Mac. Additional bass keys in color white available. Shipping in a special made flightcase. Collection by the customer in Vienna possible. Pianoteq is an award-winning virtual piano, providing a physical model that simulates properties and behaviours of real acoustic pianos. This results in a remarkably playable, vivid and adaptable instrument. You can easily install Pianoteq on any modern laptop and connect it to your LACHNIT Masterkeyboard. 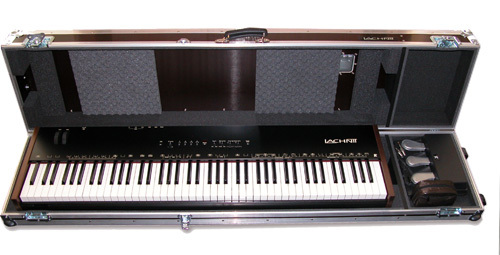 Playing Pianoteq with a LACHNIT MK is a real great experience. As a LACHNIT MK owner you can benefit from a 20% discount for products from our collaboration partner Pianoteq. Please send us your full name and your LACHNIT MK serial number. It is a great honor for us to present our MK23 in one of the finest Piano Salons in Vienna. Make your payment with bank transfer to our bank account. We ship the goods immediately after your payment has been credited to our bank account. Transport insurance to your choice. Collection by customer is possible in Vienna. Play it, enjoy it and buy it if you like. Try out our premium model MK23 in classy ambience of a certified master craftsman shop. The English version of the FLK Web will be edited constantly. If you want to have some more information, please do not hesitate to contact us meanwhile. 3 continuous touchless light sensors (no potentiometer mechanism inside) All 3 pedals are continuous 0 - 127, smoother to press, better play feel, no mechanical wear and just one plug. Anti slip mat on the bottom plate. Improved grip on wooden floor. Anti slip strips on the bottom plate. with customized padding for LACHNIT MK’s. Soft leather handle. 7mm plywood. Weight about 12 kg Made in Germany. Just one piece left in stock. As we are an Austrian company and are subject to Austrian law the terms and conditions of business are written in German language. Please refer to the AGB's Geschäftsbedingungen (= terms and conditions of business). Attention! These terms are valid only if you order from FLKeys directly (i.e. FLKeys e. U. Vienna Austria). If you order from a representative or dealer the business terms of the representative or dealer are valid! International customers are responsible for all import duties and taxes imposed by their country. If your order is returned to us for any reason (such a refusal to pay customs fees, or incorrect delivery address etc) your shipping charges are not refundable. The customer has the right to return the goods within 14 days from the delivery date. The shipment charges for both direction (from FLKeys to the customer and back to FLKeys) are not refundable. Except from any return are these articles: special designs (this includes custom made models like Imperial 97, special sidebars, case colors, case designs), articles that are not in the original conditions (e.g. used articles, dirty articles, articles with scratches or other mechanical/optical faults, articles where the housing/case has been opened, returns with missing user manuals or missing original packages). FLKeys warrants the mechanical and electronic components to be free of defects in material and workmanship for a period of 2 years from the original date of purchase, in accordance with the warranty regulations described below. If the product shows any defects within the specified warranty period that are not due to normal wear and tear and/or improper handling by the user, FLKeys shall, at its sole discretion, either repair or replace the product or repay the purchase price deducting reasonable charges for the period of usage. The product has to be sent to the representative/authorized dealer where it was purchased. Shipment directly to FLKeys is applicable only if the product was purchased from FLKeys directly. If the warranty claim proves to be justified, the product will be returned to the user freight prepaid. Warranty claims other than those indicated above are expressly excluded. The product has to be returned in its original shipping carton, together with a copy of the invoice and possibly the return authorization number (in case the manufacturer, representative/authorized dealer uses the return authorization procedure). Warranty services will be furnished only if the product is accompanied by a copy of the original retail dealer's invoice. Please call FLKeys or the representative/authorized dealer during the normal business hours before returning the product and ask for the respective returning procedure. Shipments without freight prepaid will not be accepted. Free inspections and maintenance/repair work are excluded from warranty, especially if caused by improper handling of the product by the user. This also applies to defects caused by normal wear and tear, in particular, of hammer mechanics and touch felts of the keyboards, keyboard keys, rotary or slider potentiometers (including modulation wheels, pitch-bender and drawbars), sensor flags, switches, keys, buttons, sockets (e.g. miniature jack sockets, 1/4" jack sockets, USB and Midi sockets), joy sticks, ribbon controllers and similar electro-mechanical parts. If any inspection/repair of the product by FLKeys or his representative/authorized dealer shows that the defect in question is not covered by warranty, the inspection/repair costs have to be paid by the customer. Products which do not meet the terms of this warranty will be repaired at the buyer's expense. FLKeys or his representative/authorized dealer will inform the customer of any such circumstance. If the buyer fails to submit a written repair order within 4 weeks after notification, the unit will be returned C.O.D. with a separate invoice for the working hours (required to discover that the defect is not covered by warranty), freight and packing. Such costs will also be invoiced when the buyer has sent in a written repair order. This warranty is extended exclusively to the original buyer (customer of retail dealer) and is not transferable to anyone who may subsequently purchase this product. No other person or company (e.g. 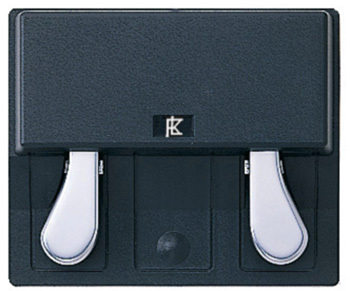 retail dealer) shall be entitled to give any warranty promise on behalf of FLKeys. Failure of FLKeys or his representative/authorized dealer to provide proper warranty service shall not entitle the buyer to claim (consequential) damages. In no event shall the liability of FLKeys or his representative/authorized dealer exceed the invoiced value of the product.